One of my favourite things about being a Mom is reliving my childhood while my daughter has hers. Whether it be reading my childhood favourite books, playing with my brother's old school 80s Fisher-Price cash register or just colouring in a colouring book (colouring NEVER goes out of style), it's fun to share experiences with Hannah that I enjoyed as a child. But my ultimate favourite thing to share with Hannah is easily the world of Sesame Street. And with the assistance of Netflix Canada, we can watch Sesame Street: Classics episodes together that I watched when I was her age. She got excited when she saw Snuffy, so we decided to watch "The Ten Commandments of Health" which featured Snuffy getting sick and seeing a doctor for the first time. It's an episode from 1983, so much of it centres around the fact the adults (side note: Maria and Bob look SO young!) 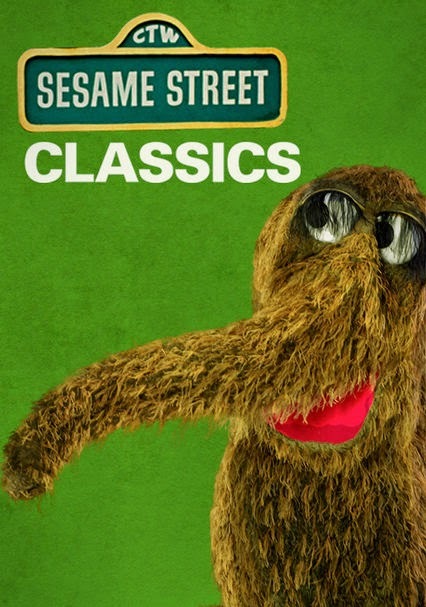 have never seen Mr. Snuffleupagus and still think he's just Big Bird's imaginary friend. Hannah didn't seem to notice. She liked Ernie protecting cookies from Cookie Monster by putting them in a safe. She also enjoyed watching Super Grover help a boy take a bus. I enjoyed watching scenes I remembered from my childhood - a Sesame Street News Flash with Kermit the Frog waiting on the mouse from Hickory Dickory Dock, the cartoon Typewriter teaching us that U is the first letter in umbrella and the cartoon about a man who replaces the fallen "O" in his Store sign with a donut and a pizza unsuccessfully. Now I just need to find an episode with Grover waiting on Mr. Johnson (to the blue man's annoyance) and Teeny Little Super Guy. Chris was a big fan of Curious George and I really liked Clifford the Big Red Dog so those are next on our list to watch. Do you watch throwback kids shows with your child(ten)?